...may have started with a puppy whining at 4:30am wanting out of her crate. ...that puppy may have continued that whine until 6:30 when I finally gave in and just got up. ...may have had dog puke in my bed. ...may have had 2 big kids who nearly missed the bus. ...may have had a very grumpy 4 year old. ...may have had a very sleepy mama. ...but it ended with cupcakes. 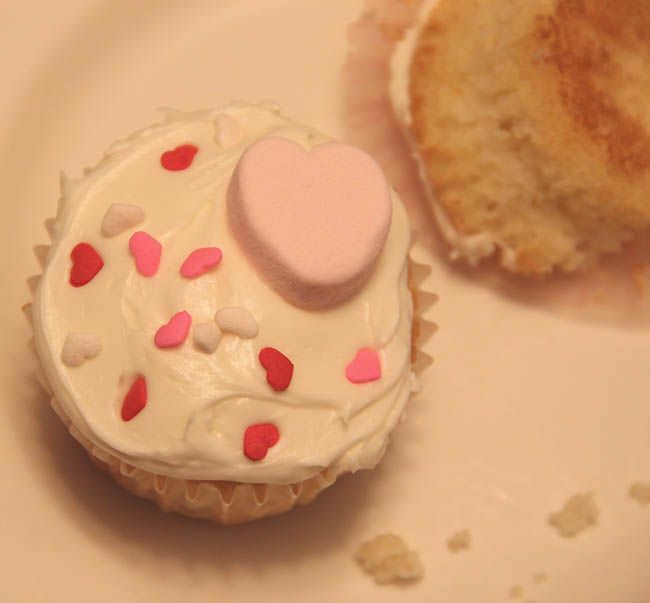 Have you seen the heart shaped marshmallows? My kids are obsessed with them! I haven't seen those marshmallows before! Oooo... I think I need some. I might even share with the kiddo. Then again, maybe not. ha! i didn't even know about the marshmallows! I may have woken up recently to a cold damp spot by my feet in bed because my 50 pound dog piddled during the night: RUDE. No more monkeys (dog) jumping (sleeping) on the bed. I can't decide which would be worse, piddle or barf, either way doing a sheet change in the night because of a D.O.G. is out of the realm of acceptable for me. Too embarassed to be anything other than anonymous today. Thanks for your comment! It means so much to me. I have blogged in 'private' for awhile but am now commenting more and reaching out to make blog friends. It's new and strange and good all at once. Poor anon made me laugh! Cupcakes always make things better. So do moms who know the secret powers of cupcakes. There is NOTHING wrong with a cupcake in the morning. I highly recommend it! Thanks for visiting my blog. I am totally gonna get something from your site. Your necklaces are WONDERFUL! Bless your heart... what a morning! You handled it well! !